How do I install a custom menu on my WordPress blog? WordPress blog themes offer many variations in appearance and features. Many themes allow you to install a custom menu in place of the default menu. 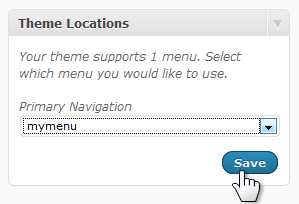 To check if your theme supports custom menus, expand the Appearance tab in the navigation pane on the left of your Dashboard. Click Themes. Your current theme will be shown on the top of the page. The illustration below shows the default theme, “Twenty Ten”. Below the theme description is a line of links titles “OPTIONS:”. 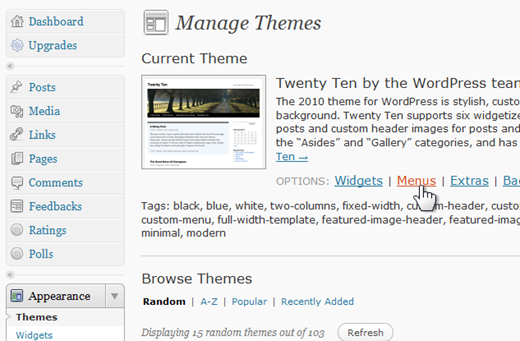 If your theme supports custom menus there will be a link there. Click the Menus link (there is also a link to Menus in the Appearance group). 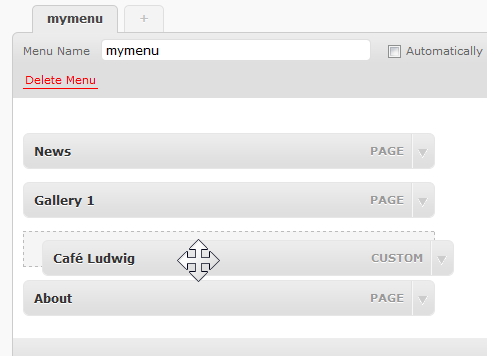 If you do not yet have a custom menu, there is just one thing to do on the Menus page, that is to create a menu. 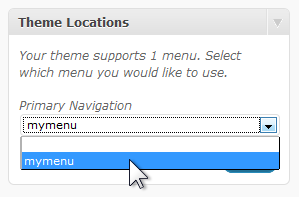 Enter a name for the menu in the box (“mymenu” will do) and click Create Menu. Now other options on this page are available. For this task, these are Theme Locations, Custom Links and Pages, see the illustration here. Start in the Pages group. Click each page you want shown on the menu so the checkmark shows, then click Add to Menu. In the Custom Links area you can enter the address of a page or website – just about anything you want to show on the menu. There is a text box for the text that should appear on the menu for this. The items you have added to the menu will show up on the right side. Here you can rearrange the order of the menu items by just dragging an item from one place to another. The illustration above shows such a maneuver. With the result that the menu item becomes a submenu under the item above it. Of course, this may be just the result you want. Submenu items appear when the pointer is moved over the menu item. See the illustration. To remove or modify a menu item, click the down-arrow on the right of the item for options. Click Save Menu to save the menu. This does not install it, there is one more step. The last step to install the custom menu is under Theme Locations. The selector under Primary Navigation shows the default, blank area and the menu you created. Click in the space or on the down-arrow, then click on your menu. Finally click Save. Now your custom menu is installed. You can modify the menu on this page. You can also revert to the default menu by selecting the blank listing under Primary Navigation (and saving, of course). This will still keep you custom menu so you can go back to it.